Oil drums were converted to stoves by removing a section of the drum wall and replacing it with a flat piece of metal. A stove pipe was added to one end and the other end was converted to a door to allow wood to be added and ash removed. This drum was set on rocks to allow for cooling airflow underneath it. A galvanized metal wash tub sits on the top of the stove. The stove is located alongside the smoke house at the Chena Indian Village near Fairbanks, Alaska. Cite as: Campbell, Sandy. 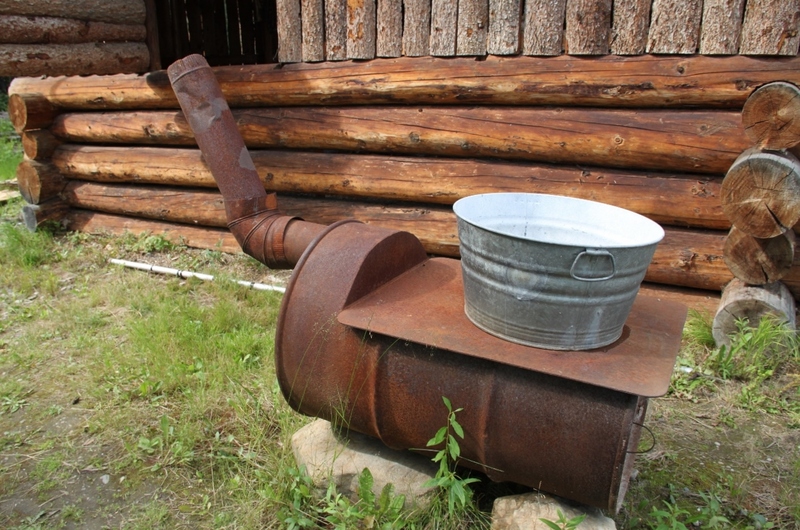 "Oil drum stove at Chena Indian Village, Fairbanks, Alaska". Photograph. 2016. University of Alberta. ERA: Education and Research Archive.